Adell, Nicolas ; Bendix, Regina F. ; Bortolotto, Chiara ; Tauschek, Markus (Eds.) 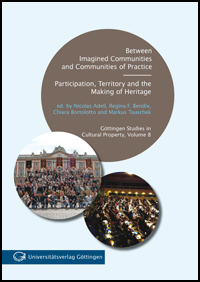 : Between Imagined Communities and Communities of Practice : Participation, Territory and the Making of Heritage . Göttingen Studies in Cultural Property, Vol. 8. Göttingen : Göttingen University Press 2015.321 Pages, Softcover. Community and participation have become central concepts in the nomination processes surrounding heritage, intersecting time and again with questions of territory. In this volume, anthropologists and legal scholars from France, Germany, Italy and the USA take up questions arising from these intertwined concerns from diverse perspectives : How and by whom were these concepts interpreted and re-interpreted, and what effects did they bring forth in their implementation ? What impact was wielded by these terms, and what kinds of discursive formations did they bring forth ? How do actors from local to national levels interpret these new components of the heritage regime, and how do actors within heritage-granting national and international bodies work it into their cultural and political agency ? What is the role of experts and expertise, and when is scholarly knowledge expertise and when is it partisan ? How do bureaucratic institutions translate the imperative of participation into concrete practices ? Case studies from within and without the UNESCO matrix combine with essays probing larger concerns generated by the valuation and valorization of culture. En savoir plus : www.univerlag.uni-goettingen.de/handle/3/isbn-978-3-86395-205-1-9782811113650.html. À noter dans cet ouvrage, l’article de Cyril Isnart (Idemec) : Self Heritage-Making and Religious Minority in Greece : An Ethnography of Heritage Activities outside of the Cultural Institutions.